The always impeccable Natalie* mentioned this Patrick Demarchelier shoot the other day, and I’ve been obsessing over it ever since. Isn’t it, like, totally radical? Gnarly, some might say. Grody, others might. But they’d be wrong. Would it be possible to time travel back to 1991 and not be a goth, but instead be a rich girl living in San Fernando? 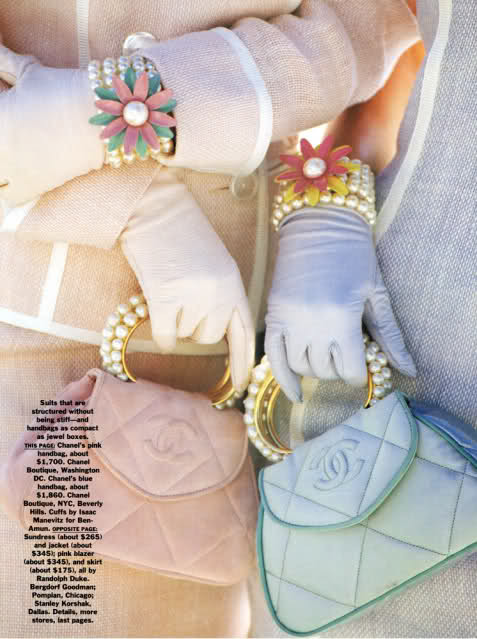 So obsessed with the pastel shades and ~ladylike~ props. I want my hair like this, a Valley Girl tan, a gingham shift and some duck egg blue gloves. Karen Mulder & Elaine Irwin, shot by Patrick Demarchelier for US Vogue, February 1991. Pics c/o The Fashion Spot, obv. *Srsly, I’m not aiming to be an Internet creep but how do people manage to look this good all the time? Incroyable.